Being able to collect feedback on community-related matters can be an extremely beneficial way to learn more about what residents want and boost resident engagement. You’ll find that you can learn a lot just by simply asking. In this article, we’ll delve further into our “Surveys” feature and how this tool can be used and applied to improving your community. Our “Surveys” feature gives you the ability to ask a series of questions while providing a way for residents to respond from their own point of view. Reviewing the responses you receive can be helpful when trying to decide on a new change to implement in your community. This will allow you to gain insight into residents’ thoughts, ideas, and opinions on community-related matters. An example of this would be to ask how they like their new community website and if there is anything they’d like to see added or removed. You could also send out a survey to ask when a specific meeting should be scheduled. Doing so will provide you with a date and time that will work best for the majority of residents, and in turn, may increase that meeting’s attendance. To learn more about how to create a survey, check out this help article for step-by-step instructions: Creating surveys. Can this be used for official voting? While the “Surveys” feature is a great tool for assessing the opinions of residents, it’s important to note that the “Surveys” feature is not an official voting feature. This feature has been designed with a few intentional limitations to discourage it from being used for official voting. This is primarily due to the difficulty involved with verifying someone’s true identity online. Even still, we encourage you to utilize this feature to collect honest feedback outside of official voting! As residents fill out and submit responses to your survey, administrators with the “surveys” privilege can view those results from the “Surveys” section in the Admin Control Panel. The responses will be displayed in the form of anonymous percentages (shown below). 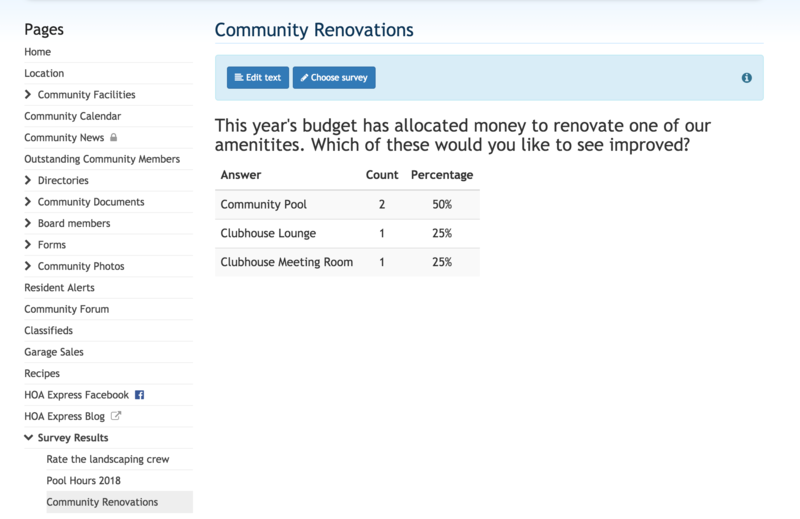 You can also display the results of a particular survey for residents to view by creating a “Survey Results” page. For surveys where you are able to share the information collected, this is a great option to help residents stay engaged in the process. Once you’ve had a chance to review the results of the survey, it’s time to decide what you’d like to do with that information. If your survey was about changing a meeting date and time, then follow through with what the majority of your residents selected. In the case you conducted a survey regarding changes to be implemented in your community, take residents’ opinions into consideration when deciding on that change or improvement. Showing the residents in your community that their voice matters will likely increase their involvement and engagement in deciding on community-related matters. Surveys can be an invaluable tool for both administrators and residents. When residents are given the opportunity to voice their own opinion on specific topics, it’s likely they’d also be more inclined to stay involved and help with the evolution of your community. Plus, asking for residents’ feedback with the “Surveys” feature introduces a sense of unity by providing an avenue for administrators and residents to collaborate together. Since there is not a limitation on the number of surveys you can create, we encourage you to use this feature as often as needed to help you become more informed and enlightened to what your residents would like to see in your community.